Our latest short film Rope A Dope will be premiering at the LA Indie Film Fest, come check it out! I’ll be there along with the producers and potentially the other cast and crew to answer questions afterward. I’ll throw in a live back flip for free if you show up. Going South on Formosa from Santa Monica Blvd. it is the Blue Building at the end of the block. There is a 60 car parking lot that is on either side of the building feel free to park here. Additional street parking is available as well as parking in the Gateway Mall, home of Target. 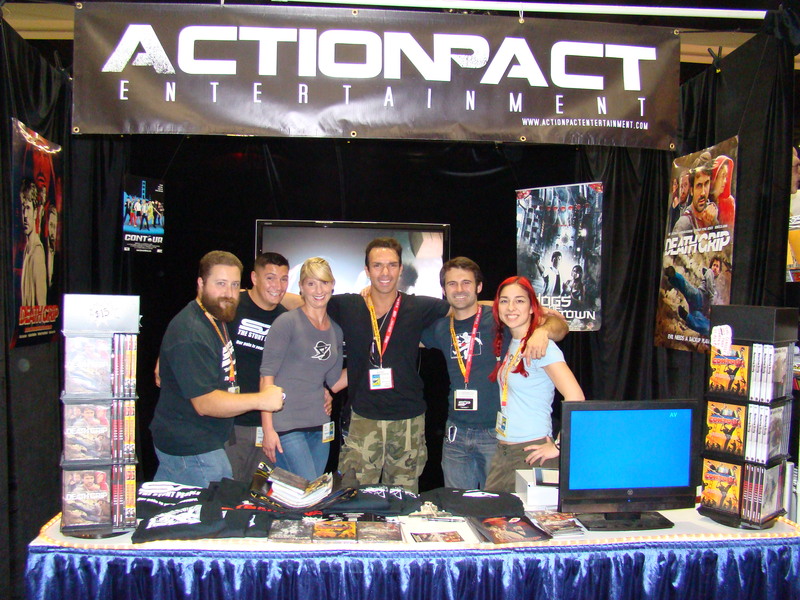 The Stunt People and Action Pact Entertainment will be present at the 2013 San Diego Comic-Con International. We’ll also be showing our latest (and as of yet unreleased) short film Rope-A-Dope at the Superhero Ric Meyers’ Superhero Kung Fu Extravaganza. R-a-D is currently running the festival circuit and there’s no telling when we’ll be able to put it online, so come check it out! 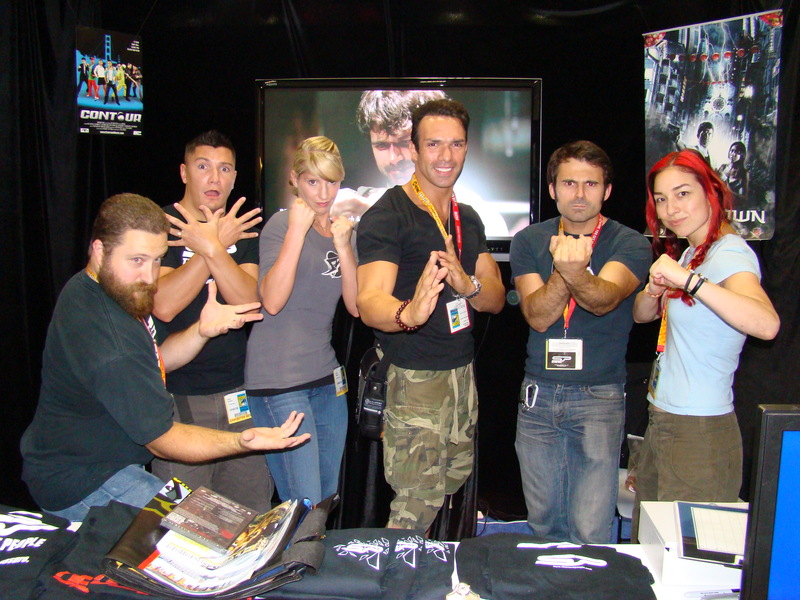 On day two of our Comic-Con 2012 visit, Darren Shahlavi stopped by the booth and remembered me from contact him on Facebook. I gave him a copy of Death Grip, and he spent an hour giving me the low-down on what it’s like being a “gwailo” (foreigner) in Hong Kong films. From his big debut as “Smith” in Tai Chi Chuen to his recent role as “Twister” in Ip Man 2, Darren’s been a force to be reckoned with on screen. I mostly asked him about Ip Man 2 since it was his latest big gig. Darren had originally seen Donnie Yen in 1991 at a seminar in the UK. You can see Darren as a teenager in the clip, and from that moment he knew he would eventually work with Donnie one day. After almost two decades it happened in, and he said they flew him around promoting the film using the story of a young boy wanting to work with Donnie finally realizing his dream, with Donnie proudly telling everyone Darren was his student. Darren would go home daily with bruises from the fight, since so much of Donnie’s choreography involved strikes to the limbs and chest and all that. “Plus I had been working out to get ripped for the fight anyway.” The fight with Donnie took ten days, which should give anyone who shoots action scenes Hong Kong-style some relief. So yes, Hong Kong takes a long time too. But they’re by no means slow. Sammo would dictate the shot style, lens, choreography, almost without any thought. Meeting Darren was no less than awesome. Here’s to a guy who made it into big Hong Kong films from just being a kid with a dream. Donnie Yen took a flight to New York very recently because he was invited to attend the yearly New York Asian Film Festival as a special guest for special showings of the 1993 kung fu action classic Iron Monkey as well as his recent hits SPL (aka Kill Zone), The Lost Bladesman and Wu Xia (aka Dragon). Since last Sunday Donnie has been present at the festival talking about his life, career, The Lost Bladesman and SPL, as well as answering questions from fans. He’s currently continuing to be present over there for interviews and Q&As with special showings of Iron Monkey and Wu Xia. Check out footage of his interviews and Q&As for The Lost Bladesman and SPL below.